↑ ၁.၀ ၁.၁ Simpson, J.; Weiner, E. (eds), ed. (1989). "Betelgeuse". Oxford English Dictionary (2nd ed.). Oxford: Clarendon Press. p. 130. ISBN 0-19-861186-2. ↑ ၅.၀ ၅.၁ Nicolet, B. (1978). "Catalogue of Homogeneous Data in the UBV Photoelectric Photometric System". Astronomy & Astrophysics 34: 1–49. Bibcode: 1978A&AS...34....1N. ↑ ၆.၀ ၆.၁ Harper, Graham M.; Brown, Alexander; Lim, Jeremy (April 2001). "A Spatially Resolved, Semiempirical Model for the Extended Atmosphere of α Orionis (M2 Iab)". The Astrophysical Journal 551 (2): 1073–98. doi:10.1086/320215. Bibcode: 2001ApJ...551.1073H. ↑ ၇.၀ ၇.၁ ၇.၂ ၇.၃ ၇.၄ Harper, Graham M.; Brown, Alexander; Guinan, Edward F. (April 2008). "A New VLA-Hipparcos Distance to Betelgeuse and its Implications" (PDF). The Astronomical Journal 135 (4): 1430–40. doi:10.1088/0004-6256/135/4/1430. Bibcode: 2008AJ....135.1430H. Retrieved on 10 July 2010. ↑ ၈.၀ ၈.၁ ၈.၂ ၈.၃ Mohamed, S.; Mackey, J.; Langer, N. (2012). "3D Simulations of Betelgeuse's Bow Shock". Astronomy & Astrophysics 541, id.A1: A1. doi:10.1051/0004-6361/201118002. Bibcode: 2012A&A...541A...1M. ↑ Smith, Nathan; Hinkle, Kenneth H.; Ryde, Nils (March 2009). "Red Supergiants as Potential Type IIn Supernova Progenitors: Spatially Resolved 4.6 μm CO Emission Around VY CMa and Betelgeuse". The Astronomical Journal 137 (3): 3558–3573. doi:10.1088/0004-6256/137/3/3558. Bibcode: 2009AJ....137.3558S. Retrieved on 9 September 2012. ↑ Lobel, Alex; Dupree, Andrea K. (2000). "Modeling the Variable Chromosphere of α Orionis". The Astrophysical Journal 545 (1): 454–74. doi:10.1086/317784. Bibcode: 2000ApJ...545..454L. Retrieved on 10 July 2010. ↑ ၁၁.၀ ၁၁.၁ Kervella, P. (September 2009). "The Close Circumstellar Environment of Betelgeuse. Adaptive Optics Spectro-imaging in the Near-IR with VLT/NACO". 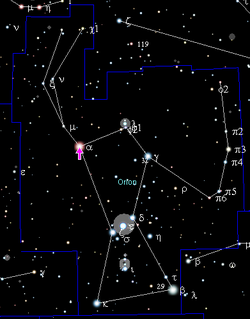 Astronomy and Astrophysics 504 (1): 115–25. doi:10.1051/0004-6361/200912521. Bibcode: 2009A&A...504..115K. Retrieved on 10 July 2010. ↑ Ramírez, Solange V. (July 2000). "Stellar Iron Abundances at the Galactic Center" (PDF). The Astrophysical Journal 537 (1): 205–20. doi:10.1086/309022. Bibcode: 2000ApJ...537..205R. Retrieved on 9 July 2010. Surface imaging of Betelgeuse with COAST and the WHT Interferometric images taken at different wavelengths. Near, Mid and Far Infrared Infrared Processing and Analysis Center (IPAC) webpage showing pictures at various wavelengths. Mars and Orion Over Monument Valley Skyscape showing the relative brightness of Betelgeuse and Rigel. Orion: Head to Toe Breathtaking vista the Orion Molecular Cloud Complex from Rogelio Bernal Andreo. The Spotty Surface of Betelgeuse A reconstructed image showing two hotspots, possibly convection cells. Simulated Supergiant Star Freytag's "Star in a Box" illustrating the nature of Betelgeuse's "monster granules". Why Stars Twinkle Image of Betelgeuse showing the effect of atmospheric twinkling in a microscope. Red supergiant movie Numerical simulation of a red supergiant star like Betelgeuse.